Benelli Chick - Brian Enos's Forums... Maku mozo! That's chicken poop! Not a safety rule at all...more like a "gotcha." I think the rules are like laws. Just because there is a law that you can't commit murder only stops the good people. They don't stop bad guys. Laws aren't proactive, they just allow penalties. You and I both know that many DQ events happen so quickly, the RO can't stop it. Now with some "safety rules" like wrong gun in a safety area...I agree it's not really a safety issue. But, like the rules of gun safety, if you are trying to follow all 4, when you break 1, it's bad, but no one dies! So you agree with that post way back there, that your score for the match would read DQ. But you and everyone else could see your stage scores of the stages before the DQ?? I think most people thought you meant you could still win if you DQ'd and were enough ahead! Just clarifying! Wanted to remind everyone, we have some spaces left for the April 13-14, 2019 Precision/Tactical 2-Rifle match at NRA Whittington Center Coal Canyon. The match will have 8 stages where you use an AR-15 for 10 targets (for 10 points) and a Precision Rifle for 5 targets (for up to 10 points) on every stage. Some stages have you moving a distance while shooting, while some have you changing positions just a little. Precision Targets are steel out to 900 yards. 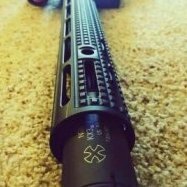 AR-15 targets are out to 400 yards, You travel about a mile and a half each day and you can have scopes, bipods, tripods, bags on whatever guns you want. You should have a pack as you carry everything with you between stages. Cost is $80. No prize table, but many sponsors and there will be gifts as well as prizes for top finishers. Applications are available at: https://johnson3gun.webs.com/ Should be a lot of fun! We hope so...a little shorter, but you'll want to bring almost the same amount of ammo! Bwahahaha! Just a reminder...Johnson 3-Gun is having a smaller version of Rocky Mountain 3-Gun August 24-25, 2019 at the NRA Whittington Center There will be 6 natural terrain stages. There will be NO PRIZE TABLE, but we have almost 40 sponsors already, so there will be gifts for various things and some cash prizes. It's dialed a back for this year and we will see going forward! Applications are available at: https://rm3gworld.webs.com/ Thanks to all these wonderful sponsors for their amazing support! American Mountain Supply, Bravo Concealment Holsters, Brownells, Bruno's Pizza and Wings, Burris Optics, CArbon Arms, CMC Triggers, Comp-Tac Victory Gear, Crossbreed Holsters, Dillon Precision, Ergo Grips, Gun Goddess, Hearing Protection Services, Hodgdon Powder, Ice House, JP Enterprises, Keltec, LaRue Tactical, Luth-AR, Mesa Tactical, Nightforce Optics, Nordic Components, Redding Reloading, Rise Armament, Seekins Precision, Sentry Hexmag, Starline Brass, Thunder Beast Arms Corp, Timney Triggers, TOP Shooting Insitute, Trijicon, Truweigh, Vortex, Warne Scope Mounts, XLR Industries, XS Sights. Applications for the 2-Rifle matches are up at: https://johnson3gun.webs.com/ Because of the concerns and not being 100% sure everything will go as planned... We ask that you send a $40 check in with the application to save your place. If you cancel more than 3 weeks out or a match gets cancelled, I will shred the check. If all goes as planned, you will owe $40 more cash or check upon arrival at the match! ? We've had talks, and there has been some motion...but there is still some issues. For 2019, we will hold 4 matches at Whittington: Johnson 3-Gun 2-Rifle match - April 13-14, 2019 - Coal Canyon Johnson 3-Gun He-Man Edition - May 18-19, 2019 Johnson 3-Gun Rocky Mountain Edition - August 24-25, 2019 Johnson 3-Gun 2-Rifle match - September 7 2019 - Coal Canyon Stay tuned for more information! Because it is tangentially safety...in other words, a procedure to abandon gun safely...we apply a higher procedural in order to keep that extra layer of safety there. People will continue to take the time to put the safety on if it's a 30 second procedural, while 5 seconds...you've shot the no-shoot (5 second penalty) and sometimes, by getting 2 targets at once, you may feel it's a win. A 30 second penalty is never a win! LAYERS works...but a gun pointed at the ground, loaded, not on safe and not being touched isn't unsafe. But, it's against the rules and is penalized thusly! (Apparently, that's not how you spell thusly!) The reason we want you to put the safety on...if you have an external safety...is that you are less likely to crank one off when getting it out of the bucket or barrel, or putting it in..etc...layers. However, if you do crank one off, you do get DQ'd for unsafe gun handling. So, putting on the safety can help the shooter out as well. So I answered your questions just not within the "survey" as using the term "unsafe" for a gun abandoned following all the NRA safety rules, just without it's external safety engaged is an inherently biased question. THAT is NOT unsafe gun handling...that term is used for, but not limited to cranking a round off when loading, unloading...not pointing down range, breaking the safety lines, abandoning a gun in an unsafe direction... If you're calling a gun that's not "on safe" unsafe, then how do you fire the dang thing safely?? WE DQ people for unsafe gun handling. Abandoning a gun in a safe manner without the external safety engaged is not unsafe. IT is incorrect abandonment procedure. And again, NO, we have NOT seen an increased incidence. Sorry! I must disagree with calling a gun pointed in a safe direction(at the ground which you would be willing to destroy), with finger off the trigger, and no one touching it, unsafe...is NOT an unsafe gun. It is a gun with the safety not on. It follows all the NRA rules for safe gun handling. We can indeed argue Glocks versus 1911's etc, but as you are assuming a gun without the external safety applied is unsafe, I cannot answer the questions...as it is a safe gun...just did not follow all safety oriented procedures. We DQ people for unsafe gun abandonment...gun pointed in an unsafe direction...not in the provided receptacle etc. And NO, we have not seen a rise in guns left in barrels or buckets not on safe. It is very rare...I believe 3 penalties for a gun not on safe has been the most at our matches over the last 8 years or so. Some years, we have had one or none.